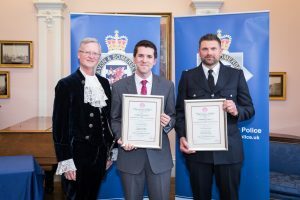 A member of staff who stopped a baby from choking in the street, a team of officers who disarmed a violent man threatening people with a hammer and a member of public who saved the life of a young woman, were just some of the officers, staff and members of the public honoured yesterday. 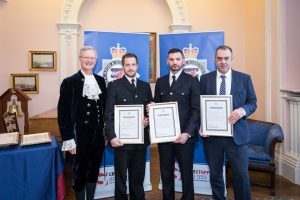 Accounts of bravery, courage and commitment were celebrated on Thursday (11 April) at an awards ceremony hosted by Avon and Somerset Police at Merchants Hall, Bristol. 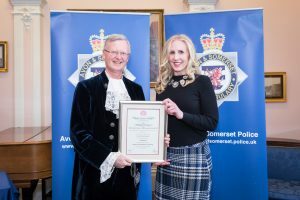 Nominees were given accolades at the event, which was attended by Chief Constable Andy Marsh QPM, Avon and Somerset Police and Crime Commissioner Sue Mountstevens, and High Sheriff of Bristol, Charles Wyld. Chief Constable Andy Marsh QPM said: “These awards celebrate people who have gone above and beyond expectations. Today we have heard extraordinary stories of courage, bravery and selflessness to help others. “The situations our officers respond to change every day and we find ourselves helping more of our communities most vulnerable. We can’t do the job alone. We rely on teamwork, the support of our colleagues and the public. Awarded by the Crown Court for significant personal courage or significant commitment in the execution of duty, above and beyond what should normally be expected. 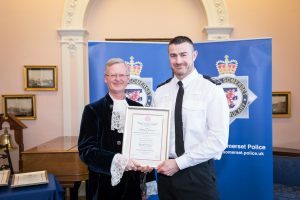 In June last year officers were responding to reports of men with weapons in the Redcliffe area, PC Luke O’Connell was on his way to the scene when he spotted a suspicious vehicle and went head to head with four offenders when they tried to flee their vehicle. At that time the officers weren’t aware that the men had just committed a murder and a grievous bodily harm using machetes, Tasers and knives. The attack and murder was linked with county lines and police successfully arrested two suspects on the same night, with another being the following day. The case was quickly investigated and brought to trial within 104 days. A great result for the force as well the family of the victim and the community affected by this violent crime. PC Luke O’Connell, PC Philip Sage and Insp Glen Boxer receiving the Crown Court Commendation from High Sheriff of Bristol, Charles Wyld. Operation Reconcile was an investigation into an Organised Crime Group specialising in blackmail. The team behind this successful investigation showed incredible team work and resulted in the imprisonment of 10 men in total. The team were awarded with the Crown Court Commendation as they went above and beyond what was expected within in their roles. For significant personal courage or significant initiative and/or commitment in the execution of duty far and beyond what should normally be expected. 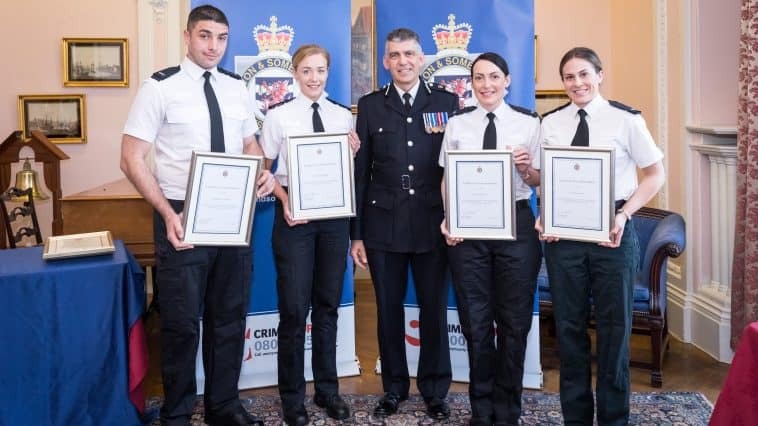 In February last year the brave actions of PC Clare Davies, PC Yasmin Kingdon, PC Ben Schofield and PC Emma Sipson f prevented further harm to the public. PC Davies spotted a man holding a hammer and was unaware he had just carried out a serious assault on someone. Working with her colleagues PC Sipson, PC Kingdon and PC Schofield surrounded the man who was being very aggressive and at one point threw the hammer at PC Davies’ head, who narrowly missed it. Officers bravely persevered and disarmed the man, putting their safety to the side to disarm the man and avoid any further danger to the public. PC Clare Davies said: “It was a team effort and everyone had their role to play in the disarming of this violent man. There may not always be time on your side in high pressured situations like this but we all remained calm and professional, focussing on the job in hand. In October 2018, Keyleigh Finn was with her daughter Indie on Hanham High Street when her little girl started to choke and turn blue, after eating a baby-friendly crisp. Panicked, the mum attempted to dislodge the food caught in her throat. At that moment Robert Stockwell, a Force Vehicle Technician, was driving past and noticed a group of people crowded around some scaffolding and knew something was wrong. Thinking that someone may have fallen he immediately pulled over and asked his wife to call an ambulance, before running over to see if he could help. Robert had recently done one day’s basic First Aid training and as no one else knew what to do he stepped in to try the back blow technique. After the fourth blow Indie finally started crying. An ambulance arrived shortly after taking the little girl to hospital for a full check-up. Keyleigh had the chance to say thank you to Robert after finding him with the help of a local PCSO on Facebook. Robert Stockwell receiving the Royal Humane Society Award from High Sheriff of Bristol, Charles Wyld. 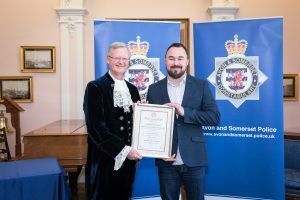 On 10th November, Matt Carter was off duty in a pub with his friends when Matt noticed a man at another table had gone rigid and his friends were struggling to stop him from falling off his chair. Matt’s instincts kicked in, gently lowering the man to the ground and he quickly found out the man’s most recent medical history. The man had a brain haemorrhage a year before, so Matt put him in the recovery position and asked someone to call 999. The man was unresponsive and struggling to breathe so Matt began CPR. Paramedics were at the scene within 10 minutes and Matt quickly handed things over to their capable hands. Matt’s usual duties as an officer kicked in and he found himself passing along his police details in case the family wanted to follow up. His quick thinking meant paramedics could stabilise the man and get him to hospital for further treatment. Sergeant Matthew Carter receiving the Royal Humane Society Award from High Sheriff of Bristol, Charles Wyld. PC Simon Weeks and PC Hannah Baynham were on shift together when they received a call to respond to a concern for welfare. A member of the mental health crisis team was concerned about one of their service users, and the woman had indicated that she wanted to harm herself. Both officers attended the address and were unable to get an answer at the door, despite repeated knocking. Both Weeks and Baynham knew that the woman presented a risk to herself and made the decision to force entry into the property. Once inside they located the woman who was in distress and quickly put her in the recovery position, while also requesting medical assistance from paramedics. They stayed with her reassuring her until ambulance arrived. 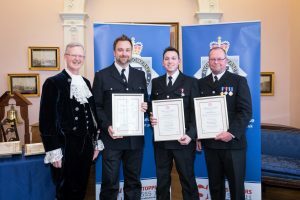 Not long after leaving the scene Weeks and Baynham received a report of on another woman in distress, who was in cardiac arrest and on the floor unable to breathe when they arrived. The officers immediately administered CPR for several minutes until ambulance attended. 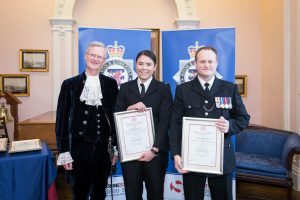 PC Weeks and PC Baynham displayed immense professionalism and determination in saving the lives of these two women in circumstances which were both physically and emotionally demanding. PC Luke Moffatt, PC Mathew Shutt and PC Julian Cornwell are usually based at Bristol Airport. In March last year, they received a call to attend a road traffic collision, initial reports suggested a driver had swerved into oncoming traffic and the driver was slumped over the wheel. Thinking ahead officers suspected that the driver may have had a heart attack, so PC Cornwell brought along a defibrillator from the airport, whilst PC Moffatt and PC Shutt made their way to the scene. Moffatt and Shutt found the driver unresponsive and not breathing. The team made the decision to remove the man from the car as he was in need of CPR and officers needed to act quickly. They took it in turns to carry out CPR while PC Cornwell set up the defibrillator to shock the driver. A medical helicopter arrived 10 minutes later and eventually took over from the officers. PC Cornwell’s decision to bring the defibrillator not doubt helped safe that man’s life as well as the continued CPR from PC Moffatt and PC Shutt. Sarah Heywood was driving with her two young boys and a friend, when she could see a young girl in distress, two police officers were trying to assist her. Realising what was unfolding in front of her Sarah decided to pull over to help, leaving her children in the car with her friend. She had received some mental health first aid training and quickly built a rapport with the girl from the street. She talked about her family and herself for half an hour, asking the girl if she needed food or was cold. This technique helped distract the 16 year old long enough for officers to make contact with the young girl’s family and other services. This help from Sarah meant officers could resolve the situation quickly and safely. The young girl left the scene safely and went on to receive the specialist care she needed. Officers were very grateful for Sarah’s help and her actions helped saved the girls life. 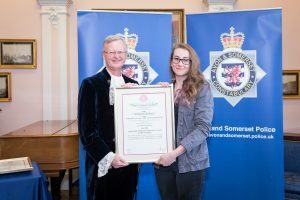 Sarah Heywood receiving the Royal Humane Society Award from High Sheriff of Bristol, Charles Wyld. In October 2018, Jessica Dyer saw a man in distress in water and instinctively offered her help to save the man, who was struggling to stay above the water. Jessica could see the man was in deep shock and stayed with him until emergency services arrived. Jessica’s actions that day undoubtedly saved the man’s life and she showed tremendous bravery and selflessness in putting her safety to the side that night. Jessica said:” I was very taken over by adrenaline – I just knew I needed to get to him. I called the police and my partner was with me in the flat and remained calm while I told him what I was planning to do. A girlfriend reported her boyfriend missing and was concerned for his welfare. Due to suffering from bi-polar disorder and his vulnerability he was quickly classed as a high-risk missing person and was in need of being found urgently. He was located in an area of danger and temporary Inspector Kurt Swallow and PC Si Hutton quickly assessed the situation. The man was visibly upset and both Swallow and Hutton worked to build up a rapport with the man, focussing on calming him down, and getting him to safety. Despite the complex situation both Swallow and Hutton displayed compassion and understanding, remaining calm despite the high pressure of the situation, talking to the man as much as possible in order to reassure him. The pair saved the man’s life and showed a huge amount empathy that day. PC Si Hutton, T/Inspector Kurt Swallow receiving the Royal Humane Society Award from High Sheriff of Bristol, Charles Wyld.